When I think back on our 7 months of travel through South and Southeast Asia, in addition to the freedom I felt, I seem to remember most vividly all the difficult moments and challenges we encountered. Ha! Of course we had a gazillion amazing, "pinch me" moments as well, but the stories of miserable heat, getting lost (over and over again), walking into a horrible smelling hotel room, etc. are just so funny and, well, memorable. While challenges are a definite part of the travel experience, it's still best to minimize them. 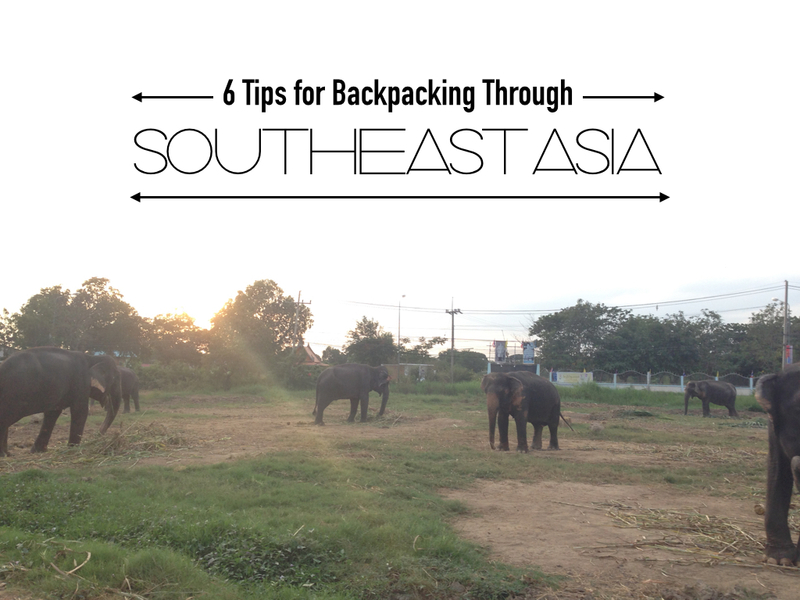 I've put together a list of tips I learned while backpacking through Southeast Asia that can help anyone planning a travel adventure of their own. 1. Drink lots of water! The last thing you want when you're traveling in a foreign and underdeveloped country is to get sick and one of the easiest ways to do so is to get dehydrated. Everywhere I went in SE Asia, I always had a giant water bottle by my side. It may seem like a pain to lug it around with you, but you really forget about it and oh my gosh, it is so worth it. 2. Always carry a sarong or scarf with you. Behold, the most versatile article of clothing ever made...the sarong! I found this helpful to have with me at all times for many reasons. When I was cold, it acted as a blanket. When I was hot, it acted as a sweat rag. When I was tired, it acted as a pillow. When I was in a bathroom with no paper towels (ha...so 99.9999 percent of the bathrooms in SE Asia), it acted as a hand towel. When I needed to cover up to enter a sacred temple, it acted as a skirt. So many uses! These things are so light and can be easily tied onto a bag so it's a no-brainer to just keep one with you. 3. Consider bringing a room spray. I didn't do this and you'll want to consider how much space you have in your backpack, but it may be worth it to bring a room spray. Sometimes rooms can have a certain smell to them and I think it does a lot for a person's mood and overall well-being to smell nice things. Room spray would be something that could easily turn a shabby, so-so room into a nice place to call home (well, as close to home as possible when you're in a very foreign land). 4. Pack light! Pack light!!! You seriously don't need much. A skirt, a pair of shorts, a handful of t-shirts, underwear, leggings, a light jacket (probably don't even need that in most countries), flip-flops, walking/hiking shoes, 1 pair of socks, a hat, a scarf, sunglasses, a guidebook, and light toiletries. Keep it simple and if you ever need something, just buy it wherever you are! I brought the ordinary school-size backpack you see below and it worked great! 5. Bargain for everything! Be kind and respectful to vendors and guesthouse owners, but don't be afraid to ask for a lower price. Some tips to remember: don't give a lower price...make them give you a lower price by saying "Hmmm....can you go lower?" with a quizzical look and small smile. If they're wavering or unsure about offering a lower price, try making small talk to divert the conversation to something more easy and fun, then come back to your original question. This may be just the break they need to come to their senses. 6. Google maps offline. I saved the best one for last. I didn't learn this one until about halfway through our travels and it was a total game changer! You can download maps for specific areas on google maps on your phone ahead of time so that you have the map when you arrive to a destination. Then, with location services enabled, you don't need wifi at all to use the map to help you get where you need to go. So, so helpful. I hope everyone had a fabulous Labor Day weekend. One of my favorite parts of summer is all the outdoor BBQs. 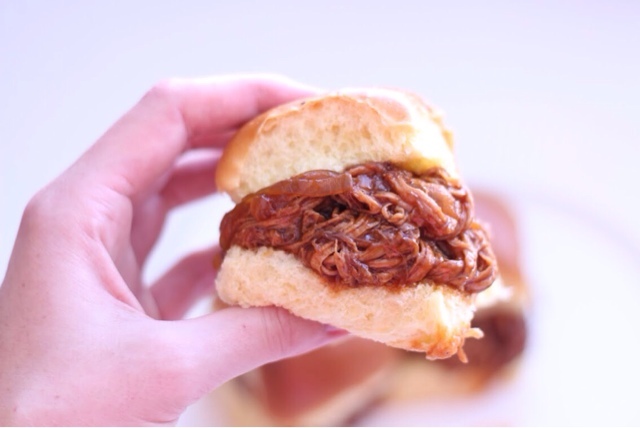 As summer comes to a close, I know the grill will be used less and less, however one of my favorite BBQ cheats is to make BBQ pulled pork in a slow cooker. You can make it year-round, but it always kinda feels like summer to me. This recipe is the best one I've tried. 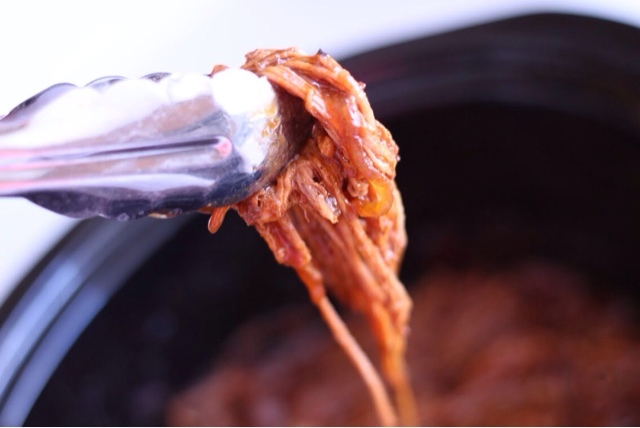 Spray your slow cooker with cooking spray and place sliced onions in the bottom. Rinse pork loin and pat dry with paper towels. Coat pork with a layer of seasoned salt and pepper. Place on top of the onions. In a medium sized bowl, mix the half bottle of BBQ sauce and the can of soda. Pour the fizzy concoction on top of the seasoned pork loin in the slow cooker. Cover the slow cooker and cook on low for 7-8 hours, or until meat is fork tender. When the meat is tender, remove from slow cooker and place on a cutting board. Shred with two forks, then return to slow cooker and stir to combine with onions. Cook another 30 minutes. 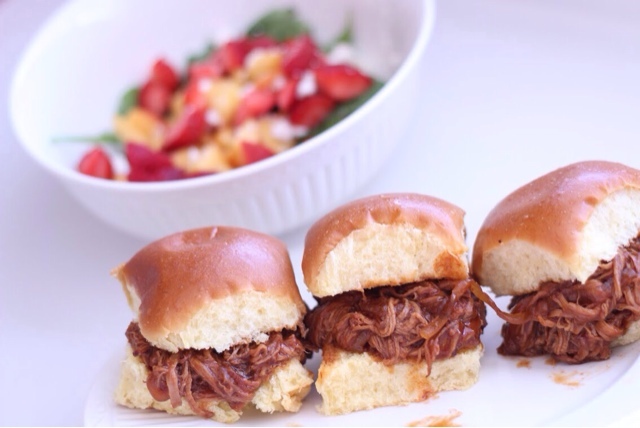 Serve on your favorite buns and plate it up with all your favorite BBQ fixins' (baked beans, mashed potatoes, corn on the cob...). ENJOY!